A workhouse is now erected here, and we felt an Advantage from it, even before it was finished; the Dread of what is called Confinement, having spurr'd on several of our Poor to labour for a Livelihood, which they would never have endeavoured, as long as they could have been relieved by the Parish-Rate, or by an Alms at our Doors; other Places are about to follow our Example. The workhouse in question was located on Dungeon Street (now Market Street) in Ashton. A parliamentary report of 1777 recorded a parish workhouse in Ashton under Line (sic) with accommodation for up to 64 inmates. 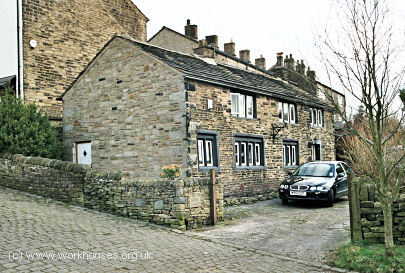 A cottage on The Stocks in Tintwistle once served as the parish workhouse. 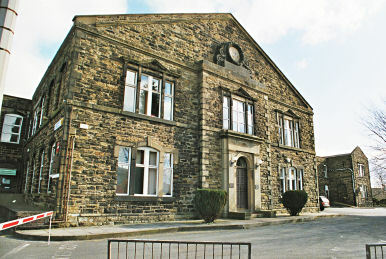 Tintwistle former parish workhouse, 2005. Lancashire: Ashton under Lyne (5), Denton, Droylsden, Haughton. Cheshire: Duckingfield [Dukinfield] (3), Godley, Hattersley, Hollingworth, Matley, Mottram, Newton (2), Stayley, Tintwistle. Later Additions (all from 1894): Alt, Audenshaw, Bardsley, Crossbank, Hartshead, Hurst, Lees, Little Moss, Mossley, Stalybridge, Waterloo, Woodhouses. The population falling within the union at the 1831 census had been 72,516 with parishes and townships ranging in size from Matley (population 262) to Ashton under Lyne itself (33,597). 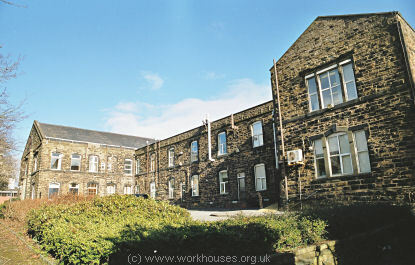 Initially, the new Ashton under Lyne Union made use of the existing parish workhouse on the Market Place which was extended to increase its capacity. Its location and layout are shown on the 1849 map below. Ashton under Lyne Market Street site, 1849. In 1849-50, a new union workhouse was built on a site at Chamber Hills to the north-east of the town, on what is now Fountain Street. It accommodated about 500 inmates and cost around £10,000. The building was constructed of stone from the nearby Barrack quarries. The workhouse location and layout are shown on the 1906 map below. Ashton under Lyne site, 1906. Ashton-under-Lyne from the south, c.1905. A long main building faced to the south-west and appears to have been extended at its northern end, some time after the original construction. Ashton-under-Lyne from the south-west, 2005. Ashton-under-Lyne entrance to main building, 2005. 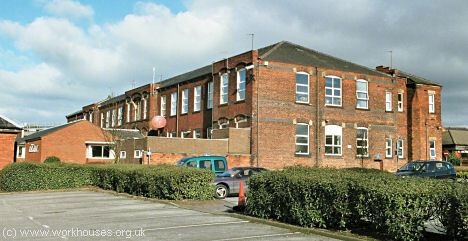 Ashton-under-Lyne main building from the south, 2005. Ashton-under-Lyne rear of main building from the east, 2005. In 1866, a new hospital block was added, followed by one for females in 1873. In 1880-1, additions costing £25,000 were made in the form of new female hospital blocks, a large dining hall, steam laundries, kitchens, washhouse etc. Ashton-under-Lyne later addition from the south, 2005. In 1897, a further ten acres were acquired to extend the buildings. In 1906, a separately administered 288-bed pavilion-plan infirmary was erected at the north-east of the workhouse. Ashton-under-Lyne 1906 infirmary from the south, 2005. Ashton-under-Lyne 1906 infirmary from the north-east, 2005. A nurses' home was erected at the south of the new infirmary. 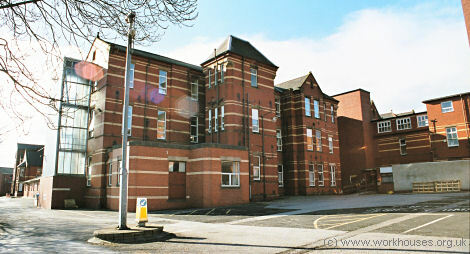 Ashton-under-Lyne nurses' home from the south-east, 2005. 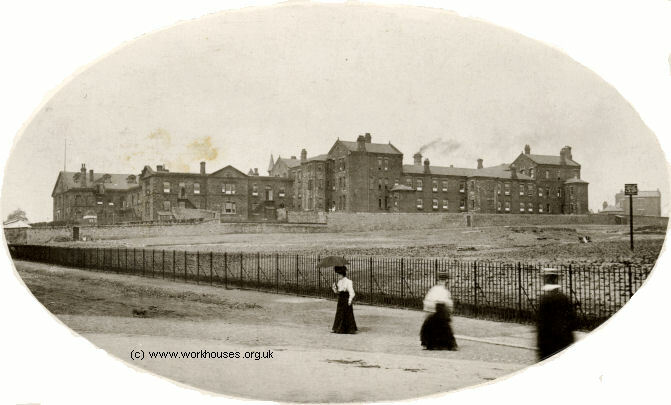 Ashton-under-Lyne nurses' home and hospital from the south-east, c.1910. 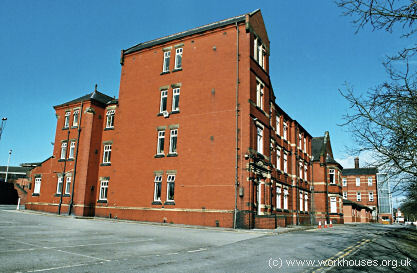 The former workhouse buildings now form part of Tameside Hospital. The Ashton Union operated several children's scattered homes. In 1924, 'West Villa', at West Street, Dukinfield, housed 16 children, and 'Kelvin', at Millbrook, Stalybridge, housed 12. By 1929, these had been replaced by a new home at 306-8 Mossley Road, Ashton-under-Lyne, which accommodated 24 children. 1841 — Governor: John Ousey; Matron: Mary Harrop. Tameside Local Studies and Archives Centre, Central Library, Old Street, Ashton-under-Lyne OL6 7SG. The union's records were pulped during the Second World War with the exception of the Union Constitution (1837) and Guardians' Minutes (1837-1930). Census Records 1841-1901 for Ashton-under-Lyne Poorhouse and Union Workhouse. Family History Society of Cheshire, Dukinfield Group. Dukinfield Family History Group [choose Groups then Dukinfield].